Fun Casino for Corporate events, Fund-raising, Theme Parties, Bond Nights, Product Launches, Dinner Dances, Private and House Parties. Fun Casinos come with fully trained and experienced croupiers and a Casino Manager who will take care of the distribution of fun money and chips ensuring the smooth running of the casino. 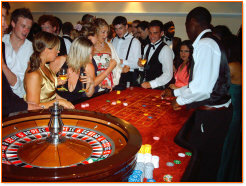 Casinos can be tailored to suit the numbers attending. How to Play: Everybody receives an amount of fun money at the start of the event, which they then cash in for chips. Players will be instructed on how to play by our Croupiers. The chips are coloured for easy recognition, and the values and uses are explained at the start of the casino. At the end of the event prizes provided by the hirer are awarded to the players with the highest amount of chips. The bigger the prize the more excited and competitive people become! Prizes can be presented by our Casino Manager, a celebrity, the managing director of the company, or anybody else you choose. Personalised fun money can also be provided with enough notice. This allows you promote your image, brand or company – all personalised fun money will feature your logo or name. No gaming licence is required.